* Smugglers' Notch, VT (smuggs.com) We rank Smuggs among the best of the best. They've created a family paradise, with a self-contained base village, programming for everyone and all-in-one pricing that's flexible—if you overlap weekends or high-season days, you only get charged high-season rates for those individual days. Their low-season (pre-Christmas, early January, late March) packages offer incomparable value. Downside: It's a fair piece to drive from many northeast population centers, getting from the main base village to Madonna and Sterling Mountains can be cumbersome, and ageing lifts might annoy some. * Mount Snow, VT (www.mountsnow.com): Often referred to as the "closest big mountain to New York City," Mount Snow has a glittery history of prank promotions. Today, it has evolved into a major monster of terrain parks partnered with parent–pleasing family programs. The ski/ride school does a super job with kids, and the special events line-up runs nonstop, highlighted by two Nickelodeon Family Fest events starring SpongeBob SquarePants and Dora the Explorer. The typical American Skiing Company Grand Summit Hotel heads the lodging line-up, but there’s plenty of slopeside condo development and less expensive shelter along Route 100. Apres-ski? How about 10-pin bowling just down the road? Now, that’s different. Downside: there’s no real town center here, and the place can resemble a December 26th mob-scene-at-the-mall on busy weekends. * Snowshoe Resort, WV (www.snowshoemtn.com): Snowshoe likes to identify itself as "an upside down mountain" - that's to say, the "base" village is set on a ridge at the top of the lifts and runs. There are advantages to this. Like you don't have to take that long, cold after-lunch lift ride. But, it's not upside-down-ness that makes Snowshoe a good family value. It's the combination of plenty of long, cruising runs, terrific terrain parks, a variety of ski/stay packages and an abundance of family-oriented on- and off-snow programming. With 57 runs, night skiing/riding, 100% snowmaking and excellent kids/day care facilities and programs, Snowshoe lives up to the standards of its Intrawest parent and its more famous name cousins like Whistler and Stratton. This probably is the best family destination in the mid-Atlantic. Downside: it's a long drive from anywhere, even Baltimore and Washington, DC. Mount Sunapee, NH (mtsunapee.com): A user-friendly, low-key, mid-sized area set in a state park, Sunapee is approachable in size, offers a friendly "local" atmosphere, practices good grooming and contains an excellent children’s center. Add spectacular lake views, a single base area, terrain parks that grow better each season, and a superpipe, and the whole is greater than the sum of its parts. Downside: no on-slope lodging and limited true expert terrain. Jay Peak, VT (jaypeakresort.com): Jay gets more snow than anyone else in the northeast thanks to a phenomenon called Orographic Lift (no, we’re not going to try to explain it—check their website), and their relatively remote location keeps the crowds small. The place has a user-friendly layout, spectacular tree skiing for all abilities, excellent expert and adventure skiing, a brilliantly conceived 80-acre/4-lift "Beginner Terrain Zone" and a simple base area layout with adequate accommodations. They also accept Canadian money at par. Downside: it’s far away and can be cold, has limited non-ski diversions and a commitment to parks/pipes that has only been slowly improving. 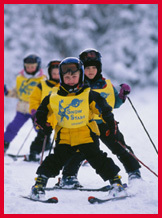 * Jiminy Peak, MA (www.jiminypeak.com): Our choice for the best of the smaller northeastern resorts, Jiminy has nice slopeside lodging, a user-friendly, and a single base area with recently added retail, amenities and kids’ center. They’ve created superb intro to ski/ride programs, which is augmented by a kids 12 and under stay free program, it’s easily accessed from major northeastern metro areas, and they’ve installed a "coaster" ride to entertain non-skiers. Downside: being more southerly, rain can be a factor, you must travel a bit to shop, and it might not keep better sliders occupied for more than a day or two. * Waterville Valley, NH (www.waterville.com): You’ve gotta like a resort that was among the first to create a miniature terrain park for the little ones and beginning tricksters. The village here is nice; the mountain has just one main base; one-price day tickets with reduced costs add-a-day pricing makes weekend visits easier; vacation packages include lodging, lifts, cross country skiing and snowshoe trail pass, White Mountain Athletic Club access, use of the valley-wide shuttle bus; there’s good programming and plenty of off-slope/apres-ski activity choices. Downside: The shopping is a bit weak and trail layout is somewhat awkward. 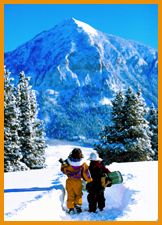 * The Big Mountain, MT (www.bigmtn.com): Whitefish is a downright folksy town with a healthy dash of sophistication. The Big Mountain, a twenty-minute drive above town, has been for the past few years in the process of building its own base village. The combination is unbeatable, offering the best of both worlds—in-town or slopeside. But, in the tradition of many resorts that started out as small town ski areas, this remains very much a locally-oriented hill, very friendly, where families have been playing for generations. As with any major destination, all the terrain you can want is here, as are the programs. But, it's small-town the ambience we love. Downside: it's a far piece from most anywhere (although if you've got oodles of time, you can arrive by train from either the Midwest or the Pacific Northwest); and, if it's important to you, it lacks the glitz of the high-end resorts. * Steamboat Springs, CO (steamboat.com): Steamboat invented the "Kids Ski Free" program, and still do it wonderfully—you buy it (lift tickets, rentals, lodging, etc. ), your kid does it free, and they’ve added "Kids Fly Free," as well. There’s good early-season discount packages, an excellent ski school and day care, special kids-only lifts, and a real town in which to play, shop and dine— or watch ski jumping competitions. Along with a full range of terrain with fantastic tree skiing, there’s a full range of lodging, slopeside or otherwise and a free bus system that goes everywhere. Here, too, as at Mount Snow, Nickelodeon Family Fests take place. Downside: the lift system can be a bit awkward; relatively low elevation can sometimes cause iffy snow; base area and getting to/from outlying condos can be confusing. * Grand Targhee, WY (www.grandtarghee.com): Our favorite “small” Rocky Mountain ski resort, it has a cute-as-a-button, self-contained base village (which will soon be expanding), a single bottom base area and an overall manageable size. Kids 14 and under ski/stay free, incredible amounts of high-quality snow falls here, there’s fine day care and ski school programming with zero crowds, even on weekends, plus on-site snowcat skiing and the ability to ski Jackson Hole for a day or two. Downside: Targhee is isolated with little shopping; the prevalent above-treeline skiing can be impossible in a whiteout; and there’s the possibility of being stranded by bad road conditions when trying to get to/from Jackson Hole. Brian Head, UT (brianhead.com): A small, pleasant eye-opener in a surprising location - just three hours from Las Vegas. Upside: small, user-friendly area without glitz; excellent daycare and kids’ programming; quiet, isolated and not overbearing in any way; learning hill is separated from the main slopes; terrific amounts of snowfall; can be combined with trips to Zion National Park, Vegas and even winter golf in Cedar City; nice tubing hill; good commitment to parks/pipes; alternatives include ski biking, Nordic and snowshoeing; night skiing and tubing; affordable pricing. Downside: high elevation can cause problems for some; isolation and small base facilities mean a poor choice for bustle, shopping and dining options; nice terrain but not too much for the adventurous. * Keystone, CO (www.keystone.snow.com): Keystone is the "forgotten" member of the Vail Resorts family, but offers fantastic lift/lodging packages that include many other on/off-slope activities; kids ski free; high standards for day care and ski school; night skiing and pipe/park; interchangeable lift ticket with Breckenridge, Vail, etc; and expanded terrain for 06-07. Downside: many base areas; tends to get snow later than its neighbors; limited shopping/dining on-site. * Park City, UT (www.parkcityinfo.com): Staying in the town of Park City gives you access to all three area resorts: Deer Valley, Park City Resort, The Canyons. All the resorts have a different personality, dining and shopping in Park City is superb, area transit is excellent, and there are many family activities besides skiing or boarding (tubing, bobsledding, luge, ice-skating, sleigh rides, horseback riding). And, you can get great multi-resort packages. Downside: the place has become a bustling ex-urban sprawl that can be crowded during traditional school vacation weeks. * Mammoth Mountain, CA (www.mammothmountain.com): Big? Oh my. Diverse? Oh yes. Mammoth lives up to its name. With a new base village fully on line, the resort that Southern Californians flock to now offers pretty much everything, from ski in/out to plain old motels and a classic mountain inn. The scale of the terrain matches just about any major resort on the continent, and the scale of the on-hill programming does, too. There’s any kind of skiing/riding you prefer. In town, there’s enough shopping, dining and alternative diversions to keep most of us occupied. For those who want a hill that’s a bit more approachable in scope, little sister June Mountain is just up the road. Downside: the is the SoCal skiing Mecca, and that means big time crowds on weekends and holidays. * Northstar-at-Tahoe (www.skinorthstar.com): Families love Northstar. Good terrain and parks, excellent service, quaint village, and good deals on vacation packages during low season. The small customer service touches—like ferrying you and your gear from parking lot to slopes—can’t be beat, and the ski school offers creative options, like parent-and-child classes and a family terrain park. Phase one of the new base village premiered in 2005-6, with a new ice rink and more shopping. New lifts and expanded intermediate terrain are in operation for 06-07. Downside: can be very crowded on weekends. Kirkwood Mountain Resort, CA (www.kirkwood.com): Not far from South Tahoe’s blazing neon lights, but a quiet retreat unto itself, Kirkwood holds huge amounts of skiing and terrain for everyone, a pleasant self-contained base village of approachable size, excellent slopeside accommodations and good daycare, but only from age two up. There’s also a nice non-ski activities selection, including tubing, skating, a snowskate park and snowshoeing; and an excellent commitment to parks/pipes. The Expedition Kirkwood program offers unique opportunities for backcountry and adventure experiences for adults and kids. Downside: no daycare for infants; limited (albeit improving slowly) dining/apres-ski options. * Silver Star, BC (www.skisilverstar.com): Ski Silver Star was conceived as a family place, and it's grown into a full-bore resort with terrain for everyone. It’s focused around a fun "western" themed base village with family entertainment some evenings. There’s good day care and kids programs, a single base, tons of snow, combination packages with Big White, night skiing, and world class Nordic—all at significantly lower pricing than coastal BC resorts. Downside: isolated; limited dining/shopping options. 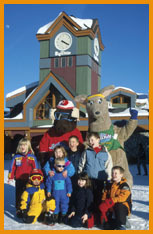 * Big White, BC (www.bigwhite.com): Sister resort to Silver Star, Big White, too, was created for families. We're talking about ski weeks that feature a skating party every Friday, a games-and-movie night for 6-12 year olds, a Wednesday theme night and fireworks, and a Carnival Night. Parks galore dot the mountain, from the Plaza mini-pipe right at the heart of things, to the TELUS Terrain Park that features a park, rail garden, half pipes, boarder/skier-cross, and a fun family race area. Lodging on the mountain is plentiful and runs the full range from hotel rooms to chalets. Snow conditions here are about as reliable as anywhere on the continent, and the base village is so convenient that the main street in it doubles as a ski run and pedestrian way. And, then, there's the Mega Snowcoaster Alpine Tube Ride, the largest mountain tube park in North America. Downside: it's a bit hard to reach for folks from stateside, requiring a commuter flight from Calgary or Vancouver. * Stoneham, Quebec (www.ski-stoneham.com): Mont Ste-Anne’s little brother makes up for a certain diminutive size with exceptional lift/lodging packages—even during high season, just enough terrain for everyone, a friendly day care facility, an age 6 and under skis free policy, night sliding with pipe/park and a down-home atmosphere. Downside: a bit isolated (a half-hour north of Quebec City); might not be big enough to hold older kids interest for many days; limited shopping/dining. * Panorama, BC (www.panoramaresort.com): Another family-style resort that’s grown up. Here are a nicely laid out base village, good day care/kids facilities, good terrain for all, on-site heli skiing for true adventurers and excellent lift/lodging packages all season. Downside: isolated; limited shopping/dining options.